Spotlight is a Unity 3D browser game made for Indie Speed Run 2012 competition where a game must be developed within 48 hours. This is nothing like your typical game, in a way it is somewhat confusing when you first start off without any of the real objectives displayed. 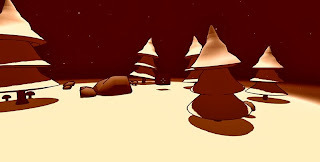 The idea of the game is that you're brought into a scene, during some time in your character’s life and choose objects in these memories that don't fit in. Then you will be brought into another scene and so on. These objects that are out of place are then all used to build the current state of where the character is located. While it may be confusing it is certainly an interesting design for a game.